There's a fascinating (and horrifying) interview on NPR about the disconnect between current research on the science of reading and how it is actually taught to children, which might explain why only a third(!!!) of American schoolchildren read at grade level. 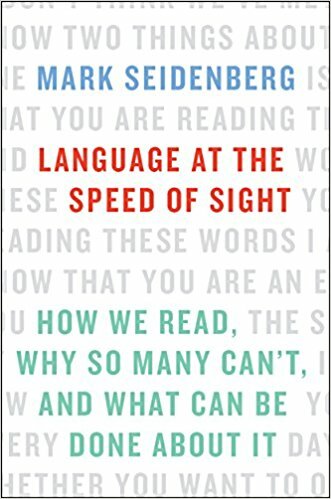 The interview subject is Mark Seidenberg, a cognitive scientist and professor at the University of Wisconsin, Madison, who has written a book called Language at the Speed of Sight. I tend to blame a lack of reading skills on a combination of parents who don't read to their children and early-education teachers who are good with kids but don't actually know enough the subjects they cover*, but I'd be happy to hear that there was some kind of silver-bullet approach we could use to close that gap. *Please note: this is not a dig. Teaching small children is an impressive and difficult skill to acquire. However, we tend to assume that it's easy for, say, a third-grade teacher to fully understand and communicate information about a wide variety of topics, from literature to math to history, and I suspect it really, really isn't. I don't BLAME elementary teachers for not knowing much about reading, but I'd like to see the situation improved.